Practice is not a matter of years or months, it is a matter of concentration and effort! Interschool Kenpo tournament Saturday 5/10/14 9:30am Oxnard sponsored by Flores Bros Kenpo Karate. Elise joined American Academy of Self Defense in January of 2014. It was apparent from the beginning that Elise was destined to shine. Always a smile in class Elise shows great enthusiasm and dedication in everything that she does. Sifu Rick and staff are always amazed at Elise’s ability to learn and give 100% effort into her training. 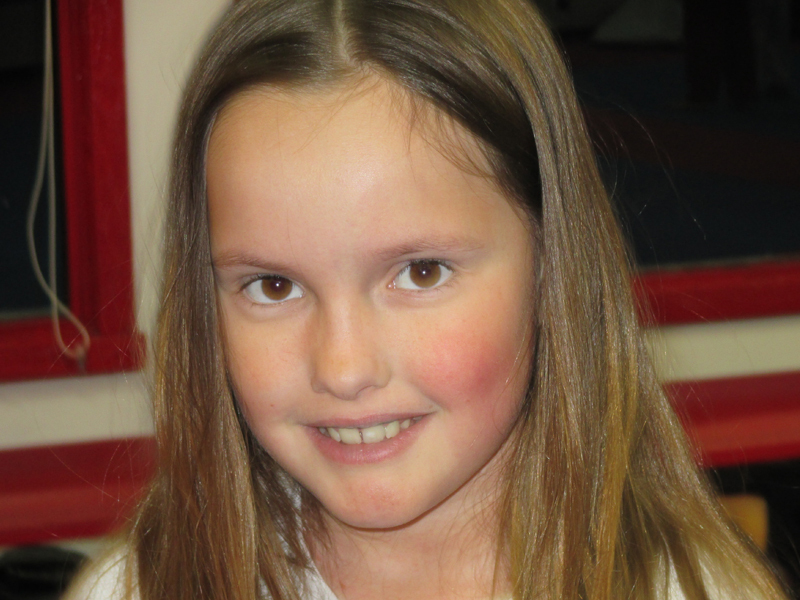 We are sure that Elise is well on her way to Black Belt and beyond, congratulations Elise. Sifu Rick and staff would also like to thank Elise’s parents Bill and Evelyne for all their support of Elis and our Black Belt school. It’s April and it is a month with which a lot history and world changes are associated. It’s been a long hard winter this year and in most parts of the world we are coming out of a deep frost or cold snap. People are starting to have spring fever but don’t put too much emphasis on the calendar. April used to be the second month in the Roman calendar which, of course, made March the first month until the Romans changed January to be the first month. So, back in the day, your spring fever would have occurred in June. If you are a jokester, you are well aware of April Fool’s day. This day may have come about when the New Year was celebrated on April 1 back in Roman times and then was changed to January 1. Some people still celebrated New Year’s on April 1 and those who would not change would usually get some type of fool’s gift which continued the tradition to this day. The diamond is the birthstone of April and the flowers that make claim to this month are either the Daisy or the Sweet Pea. Theory has it that April, which used to called Aprilis, is derived from the Latin verb Aperire, which means “to open,” this might be why April is looked at as the beginning of the trees and flowers blossoming again. People born from March 21 to April 20 are considered an Aries on an astrological calendar. People born from April 21 to May 21, you are considered a Taurus. Regardless of the history, at this time especially in the United States, April is considered the beginning of warm weather returning. People may start planting in some parts of the world or harvest in other parts depending on where you live. In many parts of the world, April brings a sort of happiness. The gloom and doom of the cold and early darkness seems to get further and further away each day and people are anxious to get back outside again, especially if they live in a part of the world that has a cold, bitter winter. Regardless of its rank, the month of April still has some very nice holiday celebrations. The warmer weather may make people feel good, and the month brings promises of spring and summer depending on where you live. So get out there and enjoy all that April has to offer. Did you know martial arts is not only great for children but great for adults as well? Most often martial arts is associated with self-defense, however there are many more benefits than just learning how to defend yourself. Listed below are just a few ways martial arts benefits both children and adults. A typical martial arts class burns 500 calories. Adding martial arts to your life can absolutely help you lose weight. Research has found the only real way to improve the status of cardio health is by doing activities that stress the heart or elevate your heart rate. Getting thirty minutes a day of a cardio exercise is a great way to stay healthy and help lower your chances of a stroke or heart attack. Martial arts is a great activity to stay healthy. Martial arts training doesn’t just burn calories and improve cardio health but it also builds muscle mass. The more muscle you have the more calories you actually burn and the more toned your body will look. Research shows practicing martial arts improves reflexes and having better reflexes can help in all aspects of life. Whether you play sports, drive a vehicle or play with your children, faster reflexes can definitely have a positive impact on one’s life. Researchers have found participating in a regular exercise routine is one of the best ways to improve your mood. Martial arts is a great activity to release endorphins which can improve your state of mind up to four hours after you are done training. Martial arts is one of the best ways to improve discipline in young children. Discipline in any person is important and learning discipline at a young age is vital to success. Martial arts is great at teaching social skills. Martial arts requires children to work together to accomplish a common goal without being competitive. When children work with other children it helps them learn and understand how to deal with different personalities and ability levels which in turn helps them become more social. Martial arts is constantly about setting and achieving goals. The belt colors used in martial arts facilities are really just rewards for all the hard work that a student puts in. Learning how to set and achieve goals is essential in succeeding in life. Martial arts is an individual, go at your own pace, activity and because of this students don’t typically feel let down or like failures. Yes, martial arts can be competitive if one chooses that path but for most students it’s about accomplishing goals and being rewarded which in turn builds confidence and self-esteem.